The Aliso Canyon natural gas well blowout, first reported on Oct. 23, 2015, released over 100,000 tons of the powerful greenhouse gas methane before the well was sealed on Feb. 11, according to the first study of the accident published today in the journal Science. The results confirm that Aliso Canyon is the largest methane leak in U.S. history. The research effort by the University of California, Davis; National Oceanic and Atmospheric Administration and partners showed that during the peak of the Aliso Canyon event, enough methane poured into the air every day to fill a balloon the size of the Rose Bowl. “Our results show how failures of natural gas infrastructure can significantly impact greenhouse gas control efforts,” said NOAA’s Tom Ryerson, co-lead scientist on the study. The disaster will substantially impact California’s ability to meet greenhouse gas emission targets for the year, the researchers said. Co-lead scientist and pilot Stephen Conley of Scientific Aviation and UC Davis said first readings in early November were so high he had to recheck his gear. 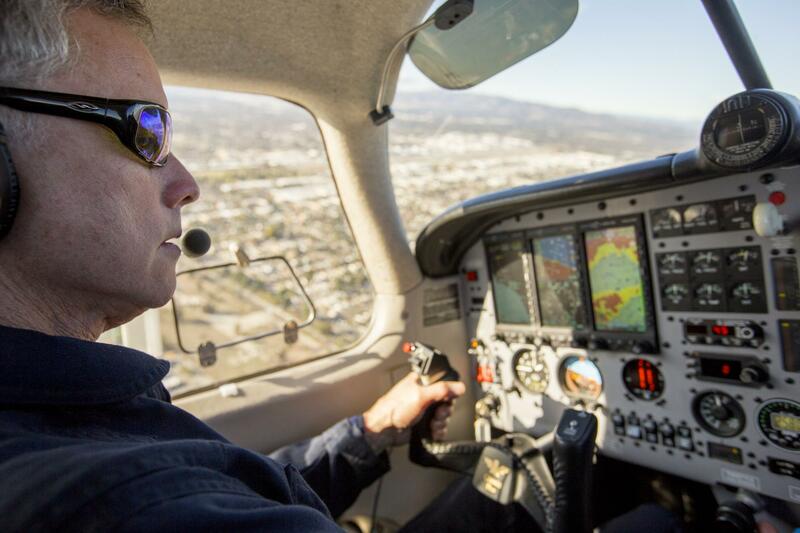 At the time, Conley and his specially equipped plane were working with UC Davis on a California Energy Commission project searching for pipeline methane leaks. The state agency asked him to overfly the area around the breached SoCalGas well. “Real-time information is invaluable for making good decisions,” said the California Energy Commission’s Guido Franco. Conley teamed with Ryerson, who pioneered techniques for assessing oil spills with airborne chemical sampling during the 2010 Deepwater Horizon oil spill and the 2012 Elgin rig blowout in the North Sea. They assembled a group of researchers from the University of California, Irvine; the California Energy Commission; and the Cooperative Institute for Research in Environmental Sciences at the University of Colorado Boulder, many of whom had previously collaborated on regional air quality projects. The team’s measurements confirmed that high concentrations of methane and ethane were surging from the breached well into the densely populated San Fernando Valley. The analysis found that at its peak, the blowout doubled the rate of methane emissions from the entire Los Angeles basin and temporarily created the largest known human-caused point source of methane in the United States, twice as large as the next-largest source, an Alabama coal mine. Eventually, more than 5,726 families were evacuated and Gov. Jerry Brown declared a state of emergency. Total emissions during the 112-day event were equal to one-quarter of the annual methane pollution from all other sources in the Los Angeles basin combined. The disaster’s impact on climate will be equivalent to the annual greenhouse gas emissions from over half a million passenger cars. During the more than three-month event, Conley made 13 research flights in his single-engine Mooney TLS, carrying instruments that provided real-time measurements of methane and ethane, two components of natural gas, and captured air samples for more comprehensive analysis later in the laboratory. In addition to providing real-time air quality data above and around the leak site to state regulators, the measurements will allow researchers the opportunity to check the accuracy of greenhouse gas measurements made using remote sensing systems such as satellites. Near the well site, co-author Donald Blake of UC Irvine gathered samples of the leaking natural gas to determine its composition and compare to Conley’s airborne measurements. The analysis found a slew of other compounds present in natural gas, including benzene, butanes, pentanes and more. The mega-leak has drawn attention to the broader problem of fugitive emissions from natural gas production, processing, pipeline and storage infrastructure across the country. The study highlights the value of rapid-response airborne sampling for independent, time-critical, accurate, and detailed information about major chemical releases, the authors said. Measuring leak rates, plume locations, and plume composition would also help officials assess public health risks, the effectiveness of leak control, and climate and air-quality impacts. The authors of “Methane Emissions from the 2015 Aliso Canyon Blowout in Los Angeles, CA”: Stephen Conley (Scientific Aviation and UC Davis), Guido Franco (California Energy Commission), Ian Faloona (UC Davis), Don Blake (UC Irvine), Jeff Peischl (University of Colorado CIRES and NOAA) and Tom Ryerson (NOAA). The work was funded by the California Energy Commission, Southern California Gas Co., the California Agricultural Experiment Station and NOAA. Press kit with photos and b-roll of flight.